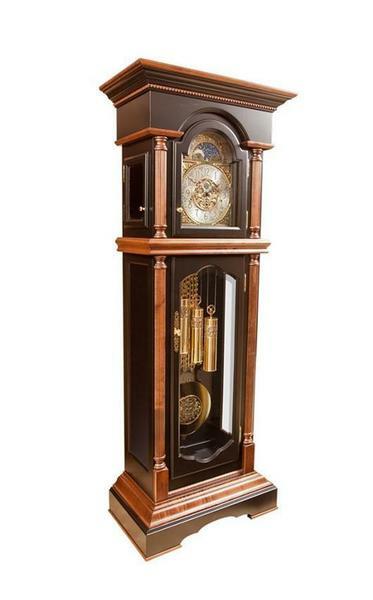 A stunning example of handcrafted American woodworking, and the finely tuned accuracy of German horology are combined in our beautiful Conestoga Grandfather Clock. At 83" tall, this masterpiece is sure to make a statement in any room it adorns. As a standard, the German made Hermle movement lies behind a beautiful polished brass dial, where intricate hand details move about to display the time. Above, a working moon phase dial will display where we are at in the lunar cycle and the date at a quick glance. To complete the piece, the winding mechanism is accessible through the face and comes with a beautiful brushed steel handle, complete with a wooden knob to tie everything together. The hinged glass door, surrounded by beautiful column moldings on each side, closes tightly to protect the dial and inner workings of your prized piece. Below, an elegant molding around the case separates the dial from the pendulum, which is surrounded by column trim and covered by another beautifully designed glass door, so you can see everything in action. Open the door to reveal polished German made brass weight shells and a classically inspired pendulum - all functioning together to keep perfect time. Below, a beautiful egg and dart molding surround the ample base, ensuring your new clock will stand firm on any flooring surface. At the top of the hour, you'll be rewarded with the beautiful melody of a Westminster, Whittington, or Stain Michael's chime that will bring a special warmth to the home. Choose which chime you prefer and don't worry about sleeping soundly - the built in night silencer ensures that your clock will not chime while you are sleeping. Each clock is handmade to order, just for you. Choose the hardwood and finish combination to complement any decor you choose. For two-tone combinations, as shown, or a completely custom wood/finish, please call one of our experienced furniture specialists today and we will be happy to provide a free custom quote for the perfect clock. Shown with brushed nickel components, hand-rubbed SCM800 stain on trim pieces, and black paint on select maple hardwoods and veneers. Actual color may vary.